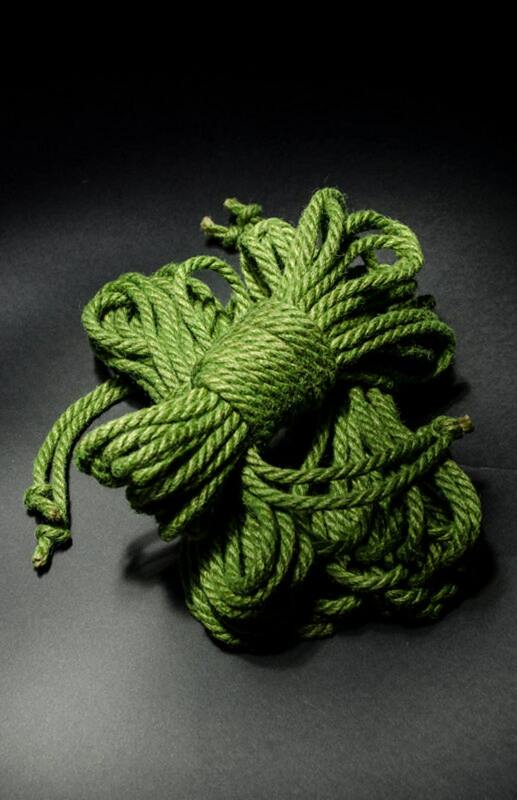 Hand crafted, quality BTS Tossa Jute Rope, dyed Kelly / Light Green. Official (uncredited) rope of the Fifty Shades of Grey movie! Strong yet soft and supple, long laid, very fast and lively for your tying and hobby needs. All of our products are made and processed by hand. Every inch of rope/twine is handled multiple times to ensure quality and care in it's making. Each rope is finished with a hard set overhand knot and ready to use right out of the box. A bargain in itself; this starter kit includes over 160 feet of hand crafted finished rope,a tote bag, conditioning wax, and safety shears, for less than 75 cents a foot! Conditioning consists of washing, pre-stretching under tension, hand conditioned with white beeswax and mineral oil. All DrexRope ropes are medium conditioned to allow for heavier conditioning, scenting, or supplemental conditioning per your personal preference. In other words, We condition it some, with room to spare. We even give you a tin of conditioner with your kit just for this purpose! Please note uncut runs are not prestretched, stretching is a momentary (less than a second) 30-50lbs of pull in line with the rope to regain it's length after wet processing. if we cut the rope done this step is completed for you. We start with BST Tossa Jute, one of the finest and strongest grades of Indian Jute fibers and operate a traditional rope walk. We wash, treat, and condition every piece by hand with hypoallergenic concerns in mind. So that the end result will be as clean and safe as you'd expect as if you made it yourself. Dyes are reactive and saturation based to get deep and uniform penetration into the rope fibers. The core will have undyed portions in minor bands due to the nature of dying rope. * Conditioning wax and instructions for upkeeping your rope. * Handy DrexRope Tote bag to keep your goodies in. Please note : Hand made and stretched rope varies, and there may be up to 0.5mm of variance per rope, basically a 5mm can be as small as 4.5mm. Also computer screen calibration and physical viewing light can affect what color the rope appears to be. Products from our workshop are guaranteed of quality and workmanship, should any substantial blemish, misconstruction, or damage be found, we will happily exchange (all or in part) or refund your purchase, less shipping charges. Please examine your order upon delivery, make sure you're happy with your order and please feel free to contact us with any questions or concerns at any time. Shipping is handled via USPS First Class Mail (Domestic and International) USPS Priority Flat Rate shipping is also available. Tracking information to be emailed upon packaging. International orders are subject to import duties of destination country, these are beyond our control and please be aware that duties may apply, and are the buyer's responsibility. It is also advisable for the buyer to supply a contact phone in the order comments for shipping purposes as the postal service may require it. Postal Services require a business name and/or first AND last names, please ensure these are supplied.